The second week of the college season has come and gone. This week saw three notable team performances, to go along with the seven individuals who shined on their own. The season is going full steam with the dual debuts of top ten teams such as Penn State, Iowa, Michigan, Nebraska, and Arizona State. There are still plenty of open tournaments, along with predetermined dual events (Journeyman Duals). In short, a lot was going on! If it seemed like there was too much to follow, here’s some help on ten of the top performances of the week. The box score may read that Jaydin Eierman defeated fellow 2018 All-American Sa’Derian Perry (Old Dominion) by a pin in the third period; however the match itself was not a lopsided affair for Eierman. Perry was not content to sit around and hope for a close match, he went after the Tiger and threw everything at him but the kitchen sink. As he has been known to do, Jaydin was able to deftly counter all of Perry’s offensive attempts and scramble his way out of multiple situations that may have caught a lesser wrestler. Late in the match, Perry attempted another leg attack; however, he was stuffed and kept his head close to his knee for too long, which allowed Eierman to sink in a tight cradle for the fall. Jaydin was one of nine Mizzou wrestlers that were victorious on Sunday in a meeting of the top two teams in the MAC. 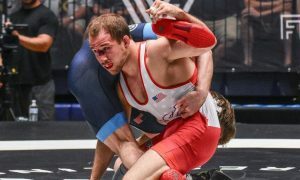 It was assumed by fans that top-recruit Chase Singletary would be the successor to Kyle Snyder after he redshirted in 2017-18 for the Buckeyes. A wrestle-off loss to Gary Traub put all of that into question for Ohio State. Last weekend, Traub would go on to represent the Buckeyes in their dual win against the Naval Academy, where he won a 3-1 decision. Singletary got back on the horse and started grinding again and picked up a title at the Michigan State Open’s Freshman/Sophomore division. Chase now has two open titles, in as many weeks, after going 4-0 and winning the Ohio Intercollegiate Open. During this week’s win, Singletary knocked off blue-chip recruit Mason Parris (Michigan) 15-9 in the semi’s. Just last week Parris blew through the field and won the open division at the Michigan State Open. That wasn’t it though, Singletary needed an 8-6 sudden victory win over Kameron Teacher (Notre Dame), a 2018 DII National runner-up, to claim his title. Traub had fallen to Teacher 5-3 in the semi’s, so it appears that the hunt for the Buckeyes starter at 285 lbs goes on for a few more weeks, at least. Chaz Tucker is on the opposite end of the spectrum from Chase Singletary. Many observers, myself included, assumed that freshmen Vito Arujau would grab ahold of the starting spot at 133 lbs for Cornell. Tucker showed on Sunday at the Jonathan Kaloust Bearcat Open that talk of Arujau taking his place is premature, 7-5 win in the tournament’s final. The senior Tucker, who is a 2018 EIWA runner-up, also had to win three other bouts before his showdown with Arujau. He did so in relatively easy fashion, as a 6-3 decision over freshman Mel Ortiz (George Mason) was his closest match before the finals. While the competition for the 133 lb spot in the Big Red lineup is far from over, the incumbent Tucker has struck first and holds an early lead. It hasn’t been often that SIU Edwardsville has signed a recruit with the type of track record that freshman Justin Ruffin could boast. Ruffin did not disappoint for his debut in a Cougar singlet, going 2-0 in two dual meets over the weekend. SIU Edwardsville traveled to Indiana Friday night and came up six points shy of upsetting Big Ten opponent. They did receive a win from Ruffin, who knocked off 2017 NCAA qualifier Jacob Danishek (Indiana) 4-1. He followed that up with a second win in Sunday’s meet against Iowa State. SIUE was overmatched from a team standpoint; however, Justin was a bright spot, defeating Chase Straw (Iowa State) 9-4 in the tiebreakers. He was the only Cougar wrestler to emerge victorious against the Cyclones. Saturday was a big day for the Wolverines of Utah Valley as they went 2-1 at the Journeyman/NE Duals, upsetting #15 Rutgers 24-14 and narrowly missed knocking off a second-ranked Big Ten team, as they fell to eighth-ranked Nebraska 19-15. Down 8-0 after two matches against Rutgers, the Wolverines got on the board as Matt Findlay picked up a fall. Two matches later Grant LaMont scored the biggest upset of the match when he downed seventh-ranked John Van Brill (Rutgers) 9-6. Counting LaMont, the last six wrestlers for Utah Valley won their matches, Against Nebraska, it was Findlay, who came up big again, this time with a 10-8 win over All-American Chad Red (Nebraska). Findlay went 2-0 on the day, as did 165 lber Demetrius Romero. 285 lber Tate Orndorff was the only wrestler to go 3-0 for the Wolverines, as they also dismantled Niagara County CC 47-6. This weekend featured two huge DII dual meetings, the first of which saw sixth-ranked Pitt-Johnstown pull a slight upset over number five Wheeling Jesuit 19-15. 184 lber Brock Biddle (Pitt-Johnstown) was named the PSAC Wrestler of the Week after he registered a major decision win over fourth-ranked Aidan Paisuk (Wheeling Jesuit) 16-6. In the only matchup between top-ten wrestlers, number five Devin Austin (Pitt-Johnstown) held off eighth-ranked Keegan Driscoll (Wheeling Jesuit) 3-1. #5 Levi Niebauer’s (Pitt-Johnstown) major decision at 197 lbs gave the Mountain Cats a seven-point lead heading into the final bout, which was crucial as Wheeling Jesuit had the returning DII National Champion Terrance Fanning waiting at 285 lbs. Penn State fans can rest a little easier after Anthony Cassar’s debut at 285 lbs against Kent State. Cassar rolled up William Bollia (Kent State) for an impressive 17-2 technical fall, which put the final touches on a 52-3 win for the Nittany Lions. Cassar has put on plenty of muscle over the summer to get up to, a reported, 235 lbs. 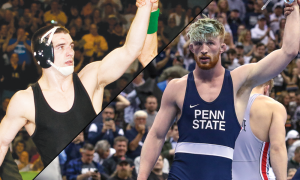 In 2018, he had competed at 197 for PSU. The returning starter for Penn State is two-time All-American Nick Nevills, who is trying to work his way back into the Nittany Lion lineup after offseason shoulder surgery. Both are supposed to enter this weekend’s Keystone Classic, and the tournament will be used as a wrestle-off, of sorts. Anthony’s performance shows that with either option they choose at heavyweight, a high All-American finish could be in the cards. Oklahoma freshman Dom Demas had quite the tournament at the Journeyman Collegiate Classic, going 3-0 at 141 lbs and taking home the tournament’s Most Outstanding Wrestler award. Demas started with a 4-2 win over NCAA qualifier Sam Turner (Wyoming). He then won his pool with an 11-4 win over another past qualifier in Kyle Shoop (Lock Haven). Dom was then pitted against a third NCAA qualifier in Nate Limmex (Purdue) who the Sooner proceeded to pin in a minute and 38 seconds. Those three wins bring Demas’ season record to 8-1, as he took fifth at the Michigan State Open, last weekend. TOM’s first DII Dual of the Week did not disappoint as second-ranked Nebraska-Kearney took a 14-3 lead over ninth-ranked Western Colorado, after five bouts. Freshman Hunter Mullin’s 5-1 win started a run of four consecutive wins for Western Colorado. In the most anticipated match of the dual, top-ranked Brandon Supernaw (Western Colorado) racked up five takedowns to drop fifth-ranked Zach Stodden (Nebraska-Kearney) 13-7. The result was still in doubt as the Mountaineers led UNK 18-14, heading into the 285 lb match. Sammy deSeriere (Western Colorado) avoided giving up bonus points to Jarrod Hinrichs (Nebraska-Kearney), losing 10-3 which preserved an 18-17 win for Western Colorado.